Clarence Evers Boyea, 90, of Chippewa Falls, passed away Thursday, Jan. 10, 2019, at St. Joseph's Hospital in Chippewa Falls with his wife, Betty, and daughter, Linda, by his side. Clarence was born to Warren and Elma (Wiese) Boyea Feb. 5, 1928 at home in Cadott. Clarence started working on cars when he was 15, and he also worked at lumbermills and on farms. He graduated from Cadott High School in 1946. Clarence worked several jobs after school, including clearing timber for the Holcombe Dam and installing power lines. He was drafted into the U.S. Army in 1950, and served as a track and wheel mechanic with the 2nd Armored Division in Germany until his discharge in 1952. He then worked in Stanley, making furniture and later pressure cookers. Clarence was married to Betty Irwin Sept. 5, 1953 at St. John's Lutheran Church in Cadott. They moved to Lake Wissota. Clarence worked at Peter's Meats in Chippewa Falls from 1954 until it closed in 1972. He started Boyea's Salvage Yard in the town of Sigel in the mid-1960s and owned and operated it until he retired in 1986. Clarence and Betty then moved to Chippewa Falls, where they have resided since. They spent their first winter in Arizona in 1992, bought a house in Green Valley, and they spent their last winter there in 2014. Clarence and Betty were members of the English Lutheran Church of Bateman for many years. Clarence is survived by his wife, Betty; two daughters, Kathy Henderson and Linda Boyea, and one son, David; grandchildren and great-grandchildren; one brother, Donald (Roberta), of Black River Falls, and sisters-in-law, Dorothy Boyea, Rosie Boyea, Arlene Boyea and Shirley Boyea; several nieces and nephews and cousins. He was preceded in death by his parents; five brothers, Ronald, Duane, Robert, Dale and Neil; his siblings-in-law Roland "Speed" and Helen Irwin, and Geraldine (Robert) "Shorty" Seichter; his son-in-law, Jeff Henderson; and grandparents, uncles, aunts, cousins, a niece and many friends. Clarence lived a long, entertaining and good life, and his mind was sharp and hungry until the end. In his younger years he enjoyed hunting and trout fishing, but he came to the point where he would rather just look at the animals. He appreciated guns and was a good shot. Clarence and Betty traveled to almost every state during their vacations, and he also enjoyed Sunday drives in the country. 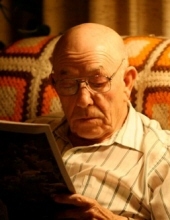 He enjoyed playing Solitaire and loved reading. He had no interest in planes or computers. His final project the past few years was fixing up his son's house. Clarence was a man who helped many people; he will be greatly missed. Funeral services are at 1 p.m. Sunday, Jan. 20, 2019 with Rev. George Olinske officiating. Visitation will be two hours prior at Leiser Funeral Home in Cadott. Inurnment will be at Northern Wisconsin Veterans Memorial Cemetery at Spooner at a later date. To send flowers or a remembrance gift to the family of Clarence Evers Boyea, please visit our Tribute Store. "Email Address" would like to share the life celebration of Clarence Evers Boyea. Click on the "link" to go to share a favorite memory or leave a condolence message for the family.